It's that time of year again! Monster Jam®, the most adrenaline charged motorsports experience for families on the planet, is coming to Kansas City's Sprint Center! Featuring affordably priced family fun, Monster Jam Triple Threat Series events have seats starting at just $15. Tickets are available online at www.axs.com, charge-by-phone at (888) 929-7849 and in-person at the Sprint Center Box Office. Save $20 when you buy a family 4-pack of tickets for any performance, at www.axs.com. The 2018 Monster Jam Triple Threat Series season will bring motorsport fans to the edge of their seats with adrenaline-charged, high-flying, four-wheel excitement that is fun for the entire family. Featuring the eight most intense athletes of Monster Jam, Kansas City fans will witness a fierce battle for the championship with each competitor using customized high-powered vehicles: Monster Jam Speedsters, Monster Jam ATVs and the famous Monster Jam trucks. - Friday, Jan. 12: 7 p.m.
- Saturday, Jan. 13: 1 p.m. and 7 p.m.
- Sunday, Jan. 14: 1 p.m. 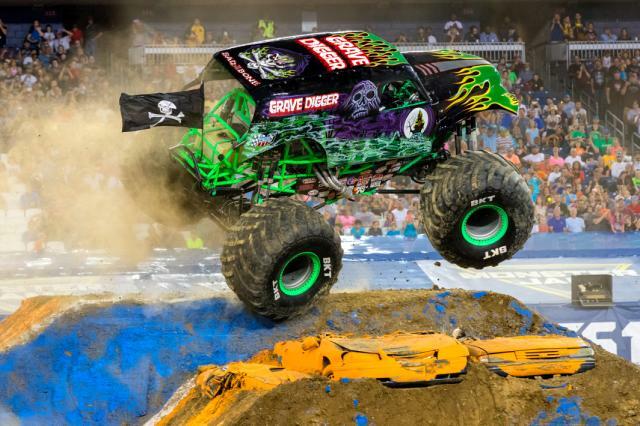 Enter to win a family 4-pack of tickets to Monster Jam in KC! To enter to win FREE Monster Jam KC tickets, head over to our Facebook page and catch the giveaway details then leave us a comment here to be entered to win! Click here for great ticket deals to Monster Jam KC! We would LOVE to take my son and daughter to this, but money is tight. My son would be over the moon. My son saw them for the first time last year. We would love to take the whole family this time! My husband and I would love to take our little one to this! Great indoor fun on this cold KC weekend! Thanks for the opportunity! 🙋🏻‍♀️ Would love to surprise my birthday boy and his brothers! !